His pine tree is also called "The Pine of Sumi-no-e" (住吉の松) and hers is the Takasago pine (高砂の松). The old woman is using a broom to sweep away trouble and he carries a rake to rake in good fortune. In Japanese this is also a play of words with "One Hundred Years" (haku > sweeping the floor) and "until 99 years" (kujuku made > kumade, meaning a rake). 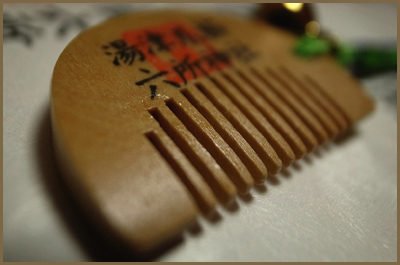 In Japan, at wedding ceremonies, the Takasago song is recited and Takasago figures are put on a special "Island Shelf" called called Shimadai (島台) together with auspicious Pine-Bamboo-Plum and Crane with Turtle decorations placed in the wedding room and presented to the bridal couple. Depictions of the Takasago figures can be made from lacquer, ceramics, wood carvings and textiles and are to invoke a long and fruitful married life for the newlyweds. These figurines are also given as presents for a wedding aniversary of 25 or 50 or more years. For the diamond wedding aniversary of 60 years, some communities also give Takasago Dolls to the happy couple. Takasago city is located in Hyogo prefecture in Western Japan. It is situated on the Seto Inland Sea approximately 40 kilometers west of Kobe. The settlement that became Takasago city was established on the delta at the mouth of the Kako River. This river formation gave rise to the name of "taka" "sago" which literally means "high" "sand", a reference to the vast amounts of sand deposited at the mouth of the Kako River. Takasago is well known as the birthplace of classical song "Yookyoku Takasago", which is a famous wedding song throughout Japan, and thus the town was declared as "The Bridal City Takasago" in 1988. According to the shrine's legend, when the Empress Jinguu returned in triumph from Korea, her ship stopped at Takasago port. She built a large shrine to maintain control of the country. Keep reading more about this old legend on the following HP. together with the moonrise, the rising tide. bove the waves far past the offing at Naruo. We have reached Sumi-no-e, already. We have reached Sumi-no-e, already! You find a full translation of the Noo Play (Noh Play) "Takasago" on the following HP. That I can call my friends? These figurines are usually a present for a wedding or wedding anniversary, as we have stated above. They are very carefully made and quite expensive, as suits the occasion. Usually the old man is placed on the left and the old lady on the right, as you face them. This is the traditional position for a pair at a wedding of the nobility. But lately at weddings the bride stands on the right side. Maybe this is a copy of the position of the Royal English Couple? Since olden times, the seat on the right has been the "Elevated Seat" (kamiza 上座) for the most noble person in the room. So maybe the position of the bride has changed in this way? We may only wonder who is the most important person at a wedding. The groom says: "You will live until one hundred (haku made>using the broom), I will live until ninety nine (kujuku made>kumade>using the rake), together we will live happily until our hair turns white!" 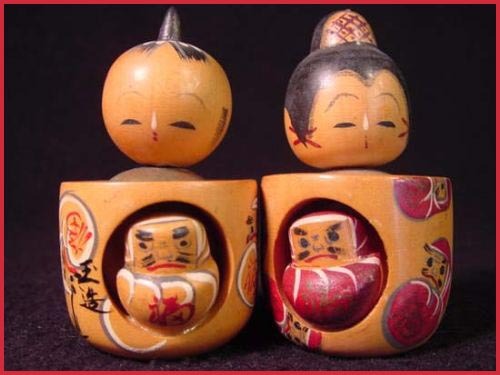 Takasago Dolls belong to the group of "Storytelling Dolls", depicting scenes of famous stories, actors, dancers or "tableaux" from familiar tales, often Noo plays. Nara Dolls typically represent Noo actors. 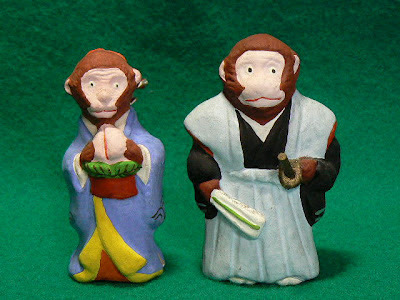 Small wooden Noo figures painted in vivid colours were first used to decorate the hats of priests and musicians at the Kasuga Shrine festival in Nara. 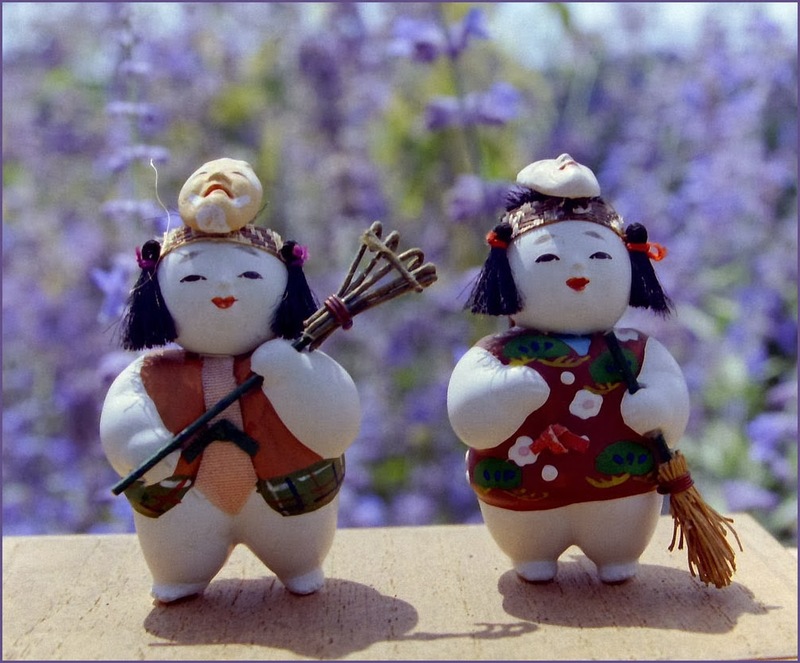 Other well known subjects are represented by Nara dolls, such as Jo and Uba, the happy old couple of Takasago. Trees growing close together or two stems from one trunk are also called "meoto". By chance I found a surprising Daruma item related to Takasago while writing this story. Click on the photo to see the single figure. At first it looks like some standing decoration figure, but as you might remember from the story about Sake pourers (Tokkuri) that the head comes off to become a little sake cup. This one is more wonderous. The head with the headband comes off and woo, there is a ladie's head beneath it. That one comes off too to bring you two cups for a happy couple. reminding us of the Takasago story and the hope that the wife will live just one year longer than her husband. The little tokkuri is just 11 cm high and nicely rounded to fit in a small hand. MEOTO can also be read FUUFU and a memorial day for happy couples is the second day of the second month, 2月2日、since FU means TWO. Some hotels and restaurants also give special reductions for couples on the 22 of any month. And if you blow on a hot soup in Japanese, your sound is: Fuu Fuu. You buy them as a pair and keep them to remind you of the endurance and perseverance it takes to make a marriage sucessfull. 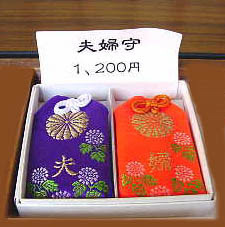 They are sold at special temples and shrines dedicated to finding and keeping a partner for life. In some areas, dolls of the Daruma Couple are burned on the last day of the New Years festiviteis. Look at more pictures of this festival on January 14th. I already introduced a nice couple in the story of Wakasa Laquer. 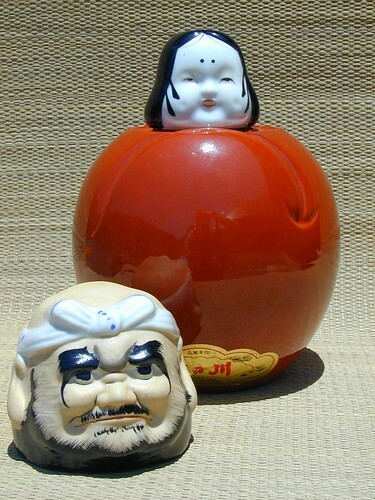 A Daruma Couple is from the Great Shrine at Miwa. In the large compounds of this shrine there is a sacred stone formation like a loving couple (meoto-iwa 夫婦岩)、and the gate leading to this stones is called "Gate of bringing together a loving couple" (enmusubi no torii 縁結びの鳥居). Our Daruma seems to be growing a beard, since his chin is colored in light gray. They are both made of papermachee, about 4 cm high and come in a little box. You can learn more about this wonderful shrine and the legends of this old site on the following HP. Next we have a couple from Arima Hot Spring near Kobe City. Legend has it that the Arima Hot Spring was discovered by the ancient gods and that it was inherited from an era of myths and legends. The Arima Hot Spring is the oldest hot spring in Japan and the name of the Hot Spring itself dates back to at least the Man-yoohshuu, the oldest anthology of Japanese poetry. 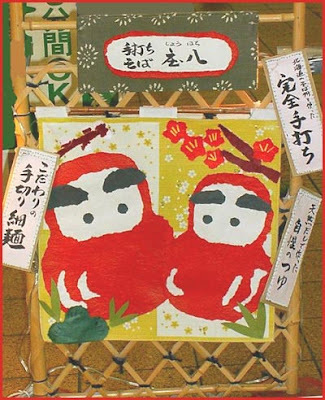 The Daruma couple is made of wood and they are standing in front of a folding screen like at a wedding reception. They are about 2 cm high, the screen is 5 cm. Mr. Daruma's belly is painted in white lines, hers in red. Once a merchant had hung up the Takasago figures at the top of his entrance. It was a prosperous sweet shop. Then the house and shop moved, but the Takasago figures did not like it at all, so they had to be left at the entrance. In Aomori a girl left her family home to become a bride and live with her husband and an old couple who looked just like the Takasago elders. When the bull turned back, after the girl had descended to go inside, in his footsteps delicious Sake begun to sprinkle over the road. 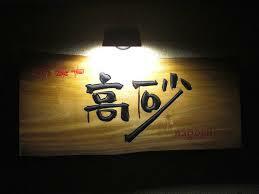 The girl has first thought to open a Sake making shop but now she turned it into a Sake drinking pub. The husband eventually divorced his wife, but the shop came into decline soon after that. If you are still looking for a good spouse, then you must pray to find a partner for life (enmusubi 縁結び). There are many shrines and temples in Japan specializing in this field of human activities and our Daruma sometimes comes as a go-between. with a little fragrance bag (nioibukuro) to go! 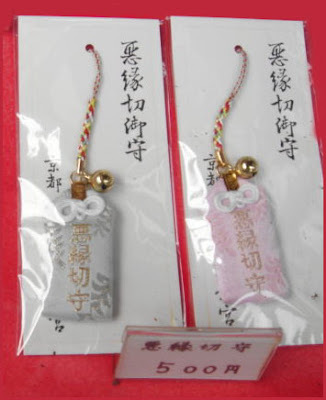 There are lot of amulets and talismans for all kinds of problems in life. One of them is the "Enmusubi Daruma", which often comes as two little plastic Darumas with a little bell each. This one was purchased at Tsuruga Castle in Aizu Wakamatsu. 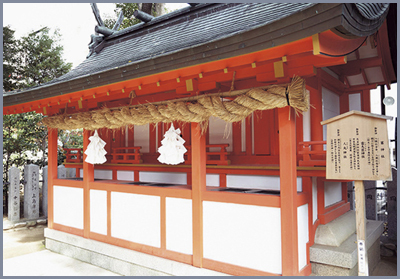 There are some shrines in Japan, dedicated to happy couples. from . Shrine Akama Jingu 赤間神宮 . in the compound of Ikuta Shrine 生田神社 .
. wagoojin 和合神 Wago-Jin - Deity of conjugal harmony . Meoto-matsu, the married pine tree, is truly a natural wonder. A pine tree and maidenhair tree grow from a single trunk, branching out separately about a meter above ground. Meoto-Matsu was the sacred tree of Akiba-jinja Shrine.
. Fushimi Inari Fox Shrine 伏見稲荷大社 .
. Hikawa Jinja 氷川神社 Saitama .
. Kifune Shrine 貴船神社 Kibune in Kurama .
. enkiri 縁切り　to cut the bonds with someone . In the collection of old Japanese legends, Koojiki, we read the story of Emperor Nintoku who fell in love with a fair princess of the Kibi area (present day Okayama prefecture) and came all the way by ship from Kyoto to meet her. Remembering this sweet love we have a papermachee doll of one body with two faces. You can buy one at Okayama station or other famous tourist places in the prefecture. If you get one you have to write your own name and the name of your beloved on two slips of paper, make a longlasting knot of the slips and hide them inside the doll while wishing for a happy future for the both of you. That should do the trick! 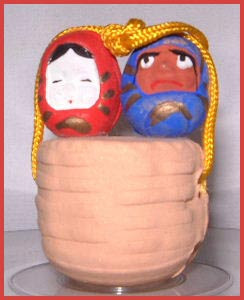 Here is one more special pair designed as ONE Daruma Doll with two faces. 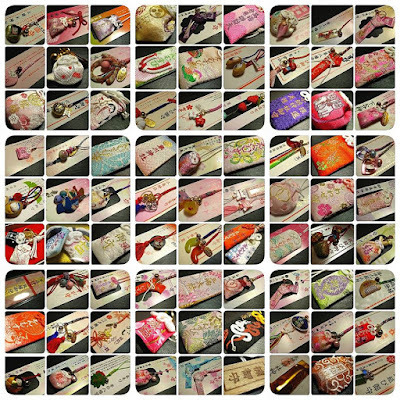 The producer, Mr. Nisaburo Yamashita had so many customers who wanted a male and female Daruma、 he decided to make it easier for them to buy just ONE doll.
. Folk Toys from Okayama . Let us look at some happy Daruma families too, while we are at this subject. 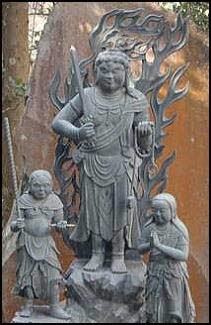 Here is a group of Father, Mother and Child from Kibitsu Shrine, in the same area of Okayama prefecture as we have talked about above. They are made of clay (tsuchiningyoo 土人形) and are about 3 cm high. Father Daruma has a round face with only a round spot in the middle. 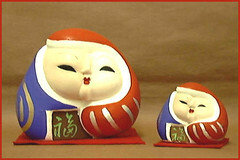 Baby Daruma has a white bottom and both mother and child have very simple facial features. All three of them have a very heavy and broad bottom part. They are sold as a talisman for finding a partner, keeping one and having children with him. This talisman had been out of making for a while, but now you can get the funny family again.
. Shrine Kibitsu Jinja 吉備津神社 .
. Mingei Kukkii　みんげいクッキー　Mingei Folk Art Cookies .
. Hashi 福だるま夫婦箸 Chopsticks for a happy couple ! Enmusubi amulets . . . click for enlargement ! was a speciality of the Himeji domain during the mid-Edo period until earlyl Showa, using the auspicious motives of pine, bamboo and plums of the local Takasgo legend and the Aioi no Matsu pine. It was a delicate dyeing method, its yukata were presented to the Shogun in Edo and later to Meiji emperor. 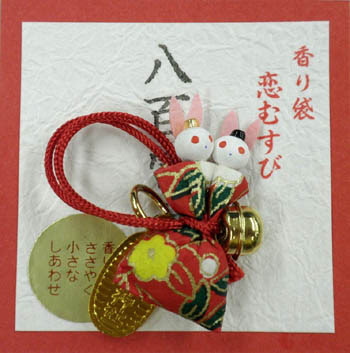 This hokku is from lunar 4/3 (May 11) in 1804, when Issa was living in the city of Edo. In the hokku Issa seems to be evoking the famous divine double pine tree in the precincts of the Takasago Shrine, located just west of Osaka. Since ancient times this single pine which is also a pair of pines -- a tree which branches off into two separate trunks just above the ground -- has been worshiped as the bodies of the two inseparable creator gods who gave birth to the cosmos in shamanic Shinto mythology. One trunk is the cosmic mother god Izanami, and the other is the cosmic father god Izanaki (or Izanagi), and the point at which the two trunks branch off from each other is the point of their unity and their fertility. These two pines love each other very much, but Issa sees that they also have a mutual friend: an imposing, many-limbed hackberry tree standing nearby in the shrine precincts. In Japanese popular religion pines were often regarded as the bodies of gods, while hackberries were commonly believed to be the homes of goblins and other semi-divine creatures, so Issa may regard them as being divine friends. The pines are evergreens, while the hackberry tree is deciduous, but the two pines in Issa's vision seem to be almost as fond of the hackberry tree as they are of each other. The time is the first week of the fourth month (May), the first month of lunar summer, when humans change into thinner robes, and the pine lovers are busy watching and praising the hackberry, which has suddenly put on a great green summer robe of long, broad hackberry leaves. Issa seems to suggest there is an intense flow of silent tree-talk being exchanged between the friends. * For the hypothesis that Takasago is the divine double pine at the Takasago Shrine, see Issa's Complete Works 2.207 note 2. I support this theory, since the Takasago Shrine double pine tree was extremely well known and was the site of a famous noh play. Even if Issa did not visit the shrine he might well have seen one of the many illustrations of the divine pine tree in various books or a representation of the pine as depicted on a noh stage. It was the most famous landmark in Takasago and therefore could be referred to simply as Takasago. Literally, Issa ends this haiku with the expression toshi no mame: "the year's beans"--referring to the good luck beans that are eaten on the year's last day.